Successfully Added Moon Jar - Solar Power LED Mood Light to your Shopping Cart. The Moon Jar collects solar energy and glows automatically at night to create attractive mood lighting both indoors and outdoors. Want to add some personality to a room or a yard? Something to make your area more welcoming, comfortable and unique as well? This Moon Jar collects sunlight during the day and glows at night. Each jar can display both blue and amber through the jar's frosted glass for a soft, cozy light. The jar is completely waterproof and can survive the meanest weather. To use the light, simply flip the switch on the jar, place it in a sunny area, and enjoy! The Moon Jar automatically charges its battery in the day and glows at night. Enjoy the welcoming light every night without worrying about setting it up. You can also use the Moon Jar to store candy, coins or collectibles - what a great way to dress up a room! This Moon Jar is designed for simplicity and elegance, but also for durability. The thick, completely waterproof glass jar can survive the toughest weather and even the neighbor's dogs! Leave the Moon Jar outside 24 hours a day, rain or shine, and continue to enjoy its soft glow after a sunny day. Use the Moon Light to create a pleasant mood for gardens, dorm rooms, childrens rooms, along driveways, near your front door or under your desk at work. The Moon Light makes a unique decoration wherever you put it! Buy more to save more, whether for your own home or for resale in your store or online shop. From you best source of factory direct electronics, Chinavasion. 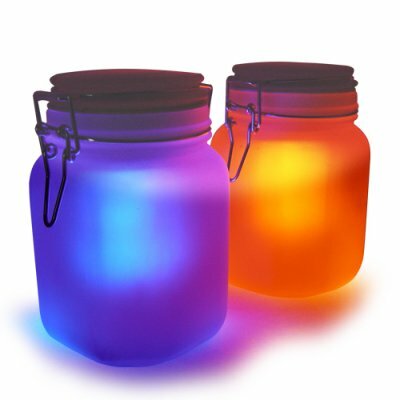 The Moon Jar glows to create attractive mood lighting. Waterproof for use indoors or outdoors. Does the light change color? Does it flash? You choose the light color manually with the switch under the lid of the jar. You can choose amber or blue. The light does not flash. The light does not change color automatically. Is it safe to leave outside? Of course! The jar is completely waterproof when sealed, and the jar itself is thick and very strong. Do I have to spend a lot of time charging it and getting it ready? No. In fact, you don't have to do anything. Just switch the Moon Jar on, leave it in direct sunlight, and it will do the rest. The Moon Jar has a light sensor that lets it charge the battery when it has sunlight and shine when the surrounding area is dark. Found that the blue colour setting uses less power than the orange and that they can be a little tricky to charge since the solar-panel has about a 1" lip on the top, but if you angle the jar, using the lid as an extra balance point, then you can better direct them towards the sunlight through a window to charge. I must say this is a great Jar safe and lights up the room and with a nice touch 5 starts! The original Sun or Moon jar comes in either amber or blue, but this jar can display both colours. It sits on my window sill and glows beautifully at night. It's the perfect night light!